April is Officialy Comics Month! 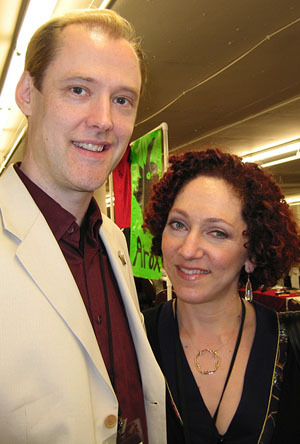 A dazed Paul and Anina at the 2008 Stumptown Comics Fest. Paul showed work in THREE gallery exhibits this month! Too Much Coffee Man opera. Did we mention the 24-hour comics Drawpocalypse at Cosmic Monkey Comics? 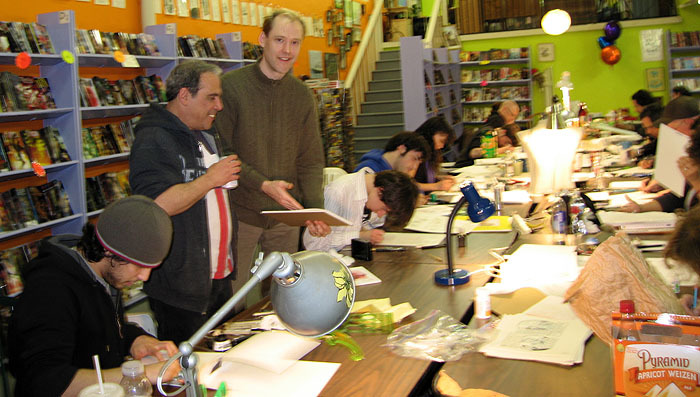 On April 5, beginning at 10:00 am, more than a dozen intrepid cartoonists took part in an effort to complete a 22-page comic in 24 hours. At around 2am Paul visited to lend support to his mad colleagues. Above: Paul with Jim Valentino and son Aaron Valentino. Left: Adam, Carol, and Angie stay awake.